For the most part, yes. There’s a prix-fixe brunch menu at Penelope. For $18, you get an entrée and a mimosa, bellini, coffee/tea, or juice. There’s also an a la carte menu if nothing catches your eye. My friend ordered the Salmon Wrapped Poached Eggs, which are served on top of toasted black bread and a salad on the side. 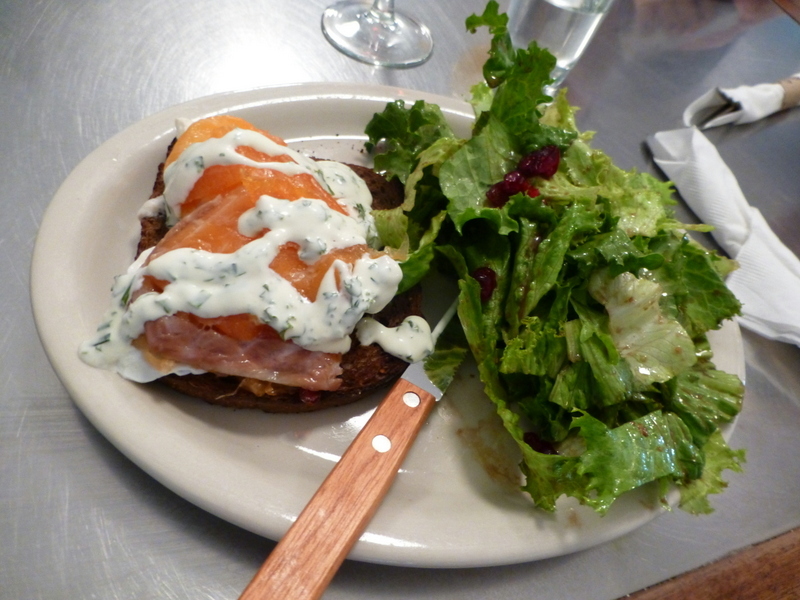 The bread was very much on the toasted side, but the addition of both salmon and ham was pretty generous. The eggs were poached perfectly. 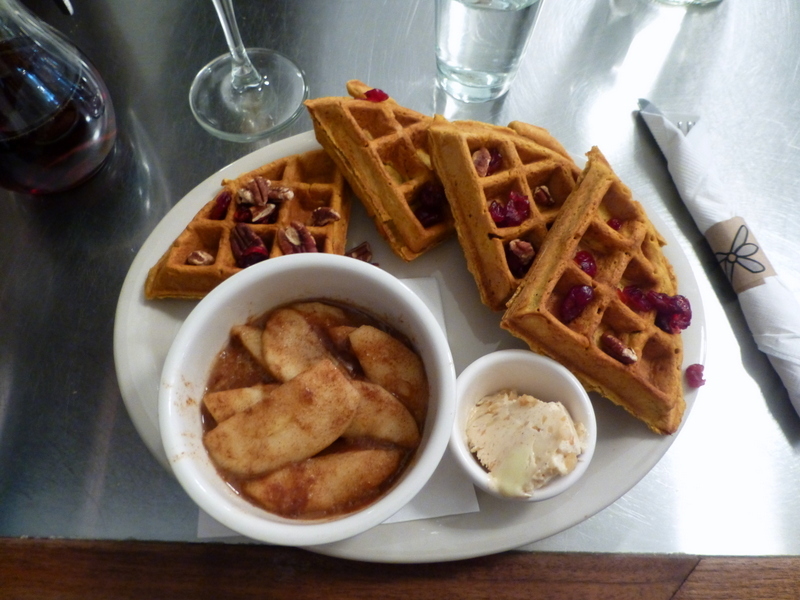 I ordered the Punkin’ Waffles which came with appled butter, baked apples, and a sprinkling of cranberries and toasted walnuts. It was like autumn hit me in the face – and I was happy about it. I really appreciated that all the apple toppings were served separately. I really don’t like when pancakes and waffles are already slathered in butter or sauces for you. Also notice that it’s appled butter not apple butter. Both are delicious, but sometimes you need good old butter and not the healthy stuff on your breakfast. I really enjoyed eating brunch at Penelope. 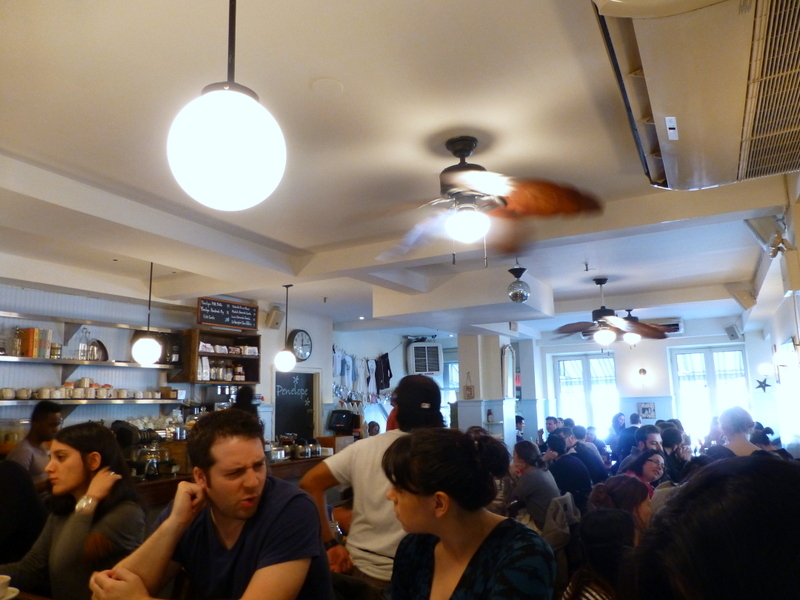 It was pretty cramped and loud inside, and the pace of the service varies, but the food was really good. The drinks were terrible, though; very watered down. My suggestion would be to go for the coffee or juice. If you’re looking for a quiet brunch, I don’t think that Penelope would be a smart choice, but I certainly wouldn’t mind eating those waffles again.